At Advanced Dental Treatment Center, our team works hard to help patients keep their smiles healthy. Ideally, we’d like for you to never have to take advantage of restorative care at all! For those who do experience tooth decay or dental damage, we’re here to help you repair the lost tooth structure and dental function with a wide range of restorative dentistry services. Two of the most commonly used restorations are dental crowns and bridges. We provide dental crowns and fixed bridges that are crafted from a variety of materials, including gold, porcelain fused to metal, and tooth-colored ceramics. Call our Greenfield dental office to schedule an appointment today. We will get started restoring your smile right away! Why Choose Us for Dental Crowns & Bridges? 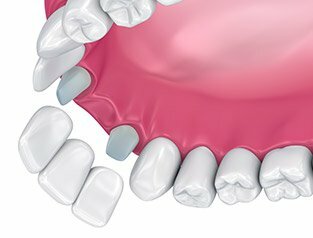 Can a Porcelain Crown Save My Tooth? A dental crown is a protective cap that is placed over a damaged or decayed tooth to restore its health, function, and appearance. The use of porcelain allows it to look like a real tooth while providing the security and support the dental structure needs to continue to thrive. 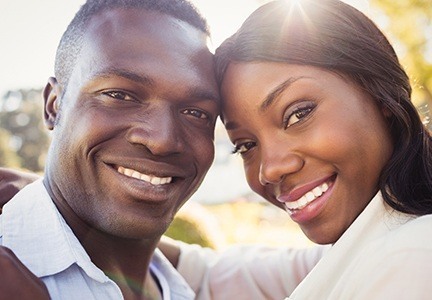 In as little as two appointments, you will restore the health of the tooth with an option that can last for several years with the right aftercare, like maintaining your oral hygiene. Unfortunately, there are times when a dental crown may not be enough to save your tooth. If this is the case, it may be in your best interest to have it extracted. 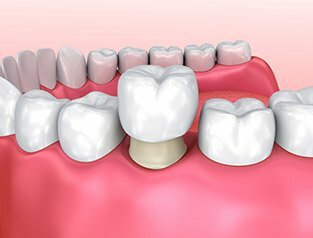 If a tooth is removed, it can be replaced with a dental implant-supported dental crown or fixed bridge. A fixed bridge is a tooth replacement prosthetic. Crafted to fill a gap left by one or more consecutive missing teeth, bridges use dental crowns attached to surrounding teeth or dental implants for support. A traditional bridge uses two dental crowns, one on each side, to support a replacement tooth or teeth. An implant-supported fixed bridge works much the same way but is connected to dental implants instead of surrounding teeth. Dental crowns and bridges are placed over the course of at least two dental appointments. During the initial visit, we prepare the teeth by removing any damaged tissue and enamel. We also need to remove a small amount of structure around the entire tooth. This allows the crown to fit snugly over the tooth without changing the natural smile line or causing crowding between teeth. 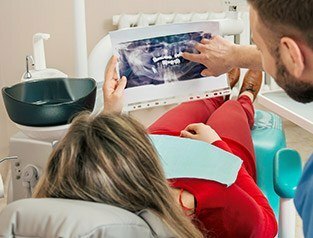 Once your tooth or teeth are prepared, we capture bite impressions. These molds of your tooth will be used by a lab to craft a custom dental crown or bridge. To protect the prepared teeth, we place a temporary restoration. When we receive your final restoration from the lab, you’ll return to our office. Our doctors will remove the temporary restoration and replaces it with your new, customized dental crown or bridge. Do I Need to Brush & Floss Differently? 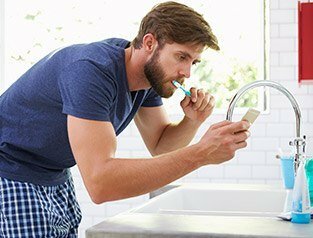 For the most part, you can continue your regular oral hygiene routine at home after getting a new dental crown and/or bridge. To protect your dental restoration, we may recommend you change oral hygiene products. Soft and ultra-soft bristled toothbrushes and minimally abrasive toothpastes will ensure you do not create excessive wear. You may also want to switch to a waxed floss or use a water flosser to avoid pulling on the restoration.